The camera however now takes the crown once again for performance in higher frame rates and includes the 4k 60fps spec which we saw debut earlier on the Yi 4k+ action camera. Also, it brings in an unexpected 2.7k 120fps spec that takes it one notch higher than any other portable cam out there. 1080p 240fps was expected and brings it in line with Phones like the iPhone 8 and X.
H.265/HEVC Video Recording Codec 30% Improvement! Mic Input YES – No Headphone Jack! GoPro Mount Compatibility With Included adapter! Available October 2nd In Quantity! HSC –The Hero 6 Black is everything that was expected from GoPro but nothing more. It is a class leading product but not a leapfrog in performance. This is the chance for GoPro to get ahead and grow as a company once more. The GP1 chip is the main cog in the wheel to make that happen. It is fast, quality processing and goes neck and neck with the most advanced out there. Ambarella will probably try to one-up GoPro to retain the action camera clone market. It is unclear at this time what kind of response the competition will have but it will have to be strong. You can see heavy aliasing on the 240fps 1080p samples which lowers the higher you go on the resolution. 2.7k has some and 4k is pretty much gone. You will not be able to use the 240fps mode for quality critical shoots but it will be a darling of Youtube footage for a long time. It is still an amazing little performance leap for a tiny camera. It is a worthy upgrade from any GoPro before it including the Hero 5 Black. Of note is the new and improved digital stabilization which aims to compete with lens stabilizers on other cameras. It is unclear how it works but it seems it is getting telemetry information from sensors inside the camera to counter vibrations and bumps. The results are extremely good “see below” and will make looking at GoPro footage a lot more pleasant. Expect to have some cropping of the sensor area as all stabilization on images yields space in the frame to reduce motion. Rolling Shutter: The GP1 will reduce rolling shutter for all the recording modes in the Hero 6 Black drastically. As you can see from the samples it seems to have improved so much that you can barely tell it has the Jello effect. More testing needed but there is a clear improvement here. There is a lot to digest from the Hero 6 Black but the clear take away from the release is that the camera is a vast improvement from the Hero 5 Black with H.265 codec support which according to GoPro yields a 30% improvement in video quality for the same bit rate. The Slow Motion performance is now class leading in the space and while there is some resolution loss; the color, dynamic range and motion qualities are excellent. The improved gimbal-like stabilization is an impressive feature that is only electronic which boggles the mind. The Price at $499 is still within affordable margins and we would be hard pressed to recommend any other action camera today when you can get so much from the Hero 6 Black. It now the gold standard in portable sport rugged cameras. It will be interesting to see how Sony and Yi will respond to this camera but if you need a new action camera to replace your older one or get your first taste of the category; the Hero 6 Black is a no-brainer decision that will deliver quality at a price that won’t hurt much. We will have more slow motion samples as they become available. Info found on the AX-700 Help Guide by our reader Slowmosage! HSC Note: Looks like the AX-700 and the other recent 1″ sensor prosumer cameras announced by Sony will forego the time priority mode in HFR for a single HFR mode with the utmost quality at 3, 4 or 5 seconds recording depending on frame rate. More info will surface after the cameras are tested in the field. You can record slower movies than movies that are recorded with the Slow & Quick Motion recording. The Super Slow Motion recording is compatible with [XAVC S HD] only. The setting items differ depending on the setting of (OTHERS) – [60i/50i SEL]. MENU button – (CAMERA SET) – [SLOW & QUICK] – [SUPER SLOW MOTION] – select the desired item. Displays the Super Slow Motion recording screen. Sets the recording format for the Super Slow Motion recording (bit-rate, image size, scanning system). Sets the frame rate for the Super Slow Motion recording. You can select the timing to start recording when pressing the START/STOP button. START TRIGGERStarts/stops recording by pressing the START/STOP button after displaying the SUPER SLOW MOTIONrecording screen. END TRIGGERStarts recording just after displaying the SUPER SLOW MOTION recording screen. Recording stops by pressing the START/STOP button. END TRIGGER HALFWorks equally to [END TRIGGER] but the recording time is reduced to a half. A: Select [EXECUTE] on the SUPER SLOW MOTION screen. You can set this function with the ASSIGN1/S&Q button. You can assign this function to the ASSIGN button. The playback speeds based on the recording format and frame rate setting are as follows. The playback speeds differ depending on the setting of (OTHERS) – [60i/50i SEL]. The recording times based on the recording format and frame rate setting are as follows. The recording times differ depending on the setting of (OTHERS) – [60i/50i SEL]. 960 fps 3 sec. 3 sec. 1 sec. 480 fps 4 sec. 4 sec. 2 sec. 240 fps 5 sec. 5 sec. 2 sec. 1,000 fps 3 sec. 3 sec. 1 sec. 500 fps 4 sec. 4 sec. 2 sec. 250 fps 5 sec. 5 sec. 2 sec. Previous PostEdgertronic SC2X Hands On Preview!Next PostSlow Motion Video Watch October ’17! The 240p on the GoPro looks fantastic! Yes it is pretty good. It has aliasing issues but overall it is well controlled. 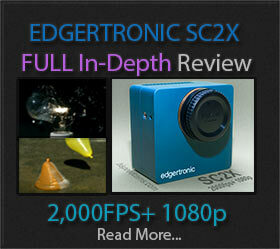 It is still not as good as the Sony RX series when shooting 240fps but that is to be expected. You take all that footage you shot at 120/240fps, you dump in in your editor, you “interpret” it to 60fps (or 30/24fps, whatever appeals to you, I like the smoothness of 60p, but I understand that some like the filmic judder of 24p), drop it on your timeline and set the percentage so that it is running at real time (eg 200% for 120fps footage on a 60p timeline). Then you start your edit. It is absolutely amazing the artistic freedom you have when you can decide **exactly** where the slow motion is going to happen. And once you’ve had the chance to do it this way, you (1) never want to go back to the limits of 3 seconds of slowmo here or 6 seconds there, and (2) you’d be shocked how often what you thought was going to be the perfect spot for slowmo while you were shooting turns out to be completely wrong, and the ideal place is somewhere different. Now, if you’d shot it on a FS700, RX10, RX100, FS5 or whatever, you’d be stuck. With continuous HFR, the sky is the limit. Disclaimer: I’ve done it both ways on cameras dating back to the Sony Z5U (one of their first semi-pro cameras with 6 second burst slowmo) & RED 1, and given the choice, I’ll always roll with continuous HFR. There is no comparison, even if you have to take a little less image quality sometimes. And Mr Admin,with all due respect, while you somewhat diss software slowmo, Premiere’s 2017 implementation of “Optical Flow” is surprisingly good. More than a few people think we are shooting at a much higher frame rate and/or much more expensive camera than we actually are!! The secret is knowing it’s limits, and how far you can push it, then never going past that point. Very valid points. Software slow motion is not for scientific, industrial or motion analysis. It can be used effectively for video production but it will not create new information. It is not a dis but there is nothing like the real thing. The higher you go in high speed the less motion blur there is due to shutter speed increments. We feel that continuous slow motion for filming is overkill and can d3stroy the film look if played back at real time speeds. Thanks for contributing to the discussion! I’m assuming from your comment that you fall into the 24p camp. Which is fine if somehow you really do prefer motion judder. But what bugs me is when the Hollywood types (and uninformed indie producers) say it’s an artistic choice. No, actually it has nothing to do with art, and everything to do with how much it cost to develop film in the early days of motion pictures. Initially, they looked at 48fps, but it was quickly ruled out as far too expensive. They settled on 24fps as a speed that is (just barely) enough to trick the human eye into thinking it is viewing continuous motion. As a result, an entire industry and equipment standard was built on a frame rate that is at best only about 6fps faster than the human eye & brain can discern separate images. Indeed, the main reason that so many movies shot on film are exposed to the left (low key, darker) is that the dimmer the image, the smoother the motion appears to be. Conversely, in bright scenes, they had a terrible time trying to make the motion look smooth. So much trouble in fact, that in the days of film projection at the movie theaters, many movie theaters had expensive equipment installed that gave perceived frame rates of 48 or 72fps, for a more enjoyable, less eye-straining viewing experience. So if 24fps is so awesome & artistic, why was so much money spend on giving the audience a better viewing experience by upping the perceived frame rate to get rid of obvious and noticeable flicker? Maybe 24fps isn’t as artistic as Hollywood wants us to think, hmm? It’s a subjective topic and after careful testing myself I like 24p the best at 180 degree shutter in video production for TV series and film. The motion aspects are subjective and a preference is a personal thing. For motion analisis 30p is ideal and for vr and live broadcast above 60p is a minimum. The hobbit in my view was ruined by the faster frame rate. As I said, a matter of personal preference. I agree with Thomas about having continuous HFR for slow motion shooting. Having 2,3,6 seconds i feel is just not long enough to give the amount of footage you need to be able to edit what you might be trying to get. If the go pro 6 updates to 420/480 fps at 720p and Wvga or vga at 800 plus fps i would get one tomorrow. All of the slow motion stuff I have got over the years is only for myself, i don’t even put it on YouTube. My ideal super slow motion speed is 420 fps at a play back speed of 30 fps to get 14 times slow motion at not less than 720p, 1080p would be perfect. It’s a waiting game I guess. In the future, it will probably be capturing the scene photon information for a given time making frame rates completely irrelevant. 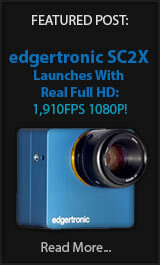 If you want 1,000,000 fps you could have it with a simple dial. Photon capture mapping is already working in the labs and has applications much more interesting than high frame rates including seeing through walls and anticipate collisions of very fast objects.